that, my friends, is tater tot casserole...the breakfast version. i feel like i've posted about this deliciousness before, but i don't think i've shared an actual recipe for it. and since a couple of people asked...well, i'm more than happy to share the details so everyone can experience the happiness of this concoction. set the oven to 350 and spray a 9" round pan (an 8" square one would work too) with your favorite nonstick spray. my current favorite is trader joe's coconut oil spray, probably because it smells lovely and makes me think of hawaii. ah, the islands. i sure hope to return someday, i love me some hawaii. sorry, i get distracted easily. anyway, whisk the eggs and milk together. ideally, you can assign this part to your kid. but if yours is anything like mine, you'll spend more time fishing little bits of eggshell out than it would've taken to get this whole shebang done. either way, it's always fun to try and get the littles involved so when you're old and tired of cooking, they can can do it for you. or, you know, they learn basic skills that will last a lifetime. whichever way you want to look at it is fine with me. pour the egg mixture into your pan, and then sprinkle the bacon bits evenly on top. your shredded cheese goes on top of that, and you can decide for yourself exactly how much you want to use. i'm honestly too ashamed to actually measure the amount we tossed in there. the bean and i like cheese, okay? 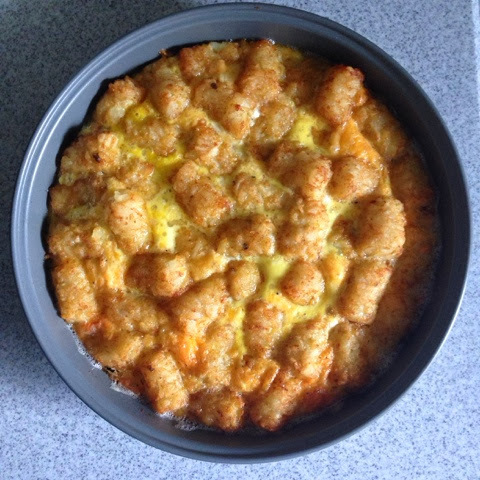 then you top that with a layer of tater tots. again, there's no scientific measurement for this. just cover the surface in a nice, even layer. pop that bad boy into your preheated oven and bake it for 35-ish minutes. Hmmm might be a good way to introduce eggs to Diego's diet. I'd have to sub the milk though. Thanks for the idea!